Back in the early eighties we carried Nancy's brother's work and have always admired her work thru the years. Mainly Nancy has worked on one of a kind and small limited edition work in the $2K and up price range but now a collector can actually acquire a beautiful Wiley piece at a fraction of the price! These pieces are wonderful! Is it a doll or is it art? Answer - Its both! Wiley treats her dolls as a three-dimensional canvases, painting the faces, bodies and clothing using a classic portrait painting technique. These dolls are just fantastic and we love the fully illustrated book that goes along with the characters. Be sure to ask about our complete Alice Set special! We are taking orders now with 25% down, balance due when in. Earliest ship is approx. 4-5 weeks at this time. You can schedule for asap or do an extended delivery layaway plan thru year end. Email Kim at kmalone@dollery.com now or call 781-447-6677 to place your order. The dolls are made of cast resin and are individually hand-painted by the artist. All dolls have fixed poses and are not on stands. *Note - be sure to email us your address and number to get on our Wiley mailing list for automatic updates on her work and if you are interested in one-of-a-kind work by her please email kmalone@dollery.com. The major scenes of the book are fully illustrated with all of the quirky characters. The photo-illustrations of three-dimensional "stage sets" provide a unique interpretation of this complete timeless classic. Order this deluxe eighty-eight page hardcover book. Mad Hatter ~ Alice meets this unforgettable character at the famous tea party - his trademark top hat is actually an upside down tea pot! Mostly sculpted, but with a soft mohair “hairpiece”. Queen of Hearts - The Maniacal Queen who bosses around the inhabitants of Wonderland wears a dress that is partly sculpted and partly painted canvas. The White Rabbit - The character who started it all! Alice followed this White Rabbit to Wonderland. His clothes are sculpted and he is holding a pocket watch with fob chain. 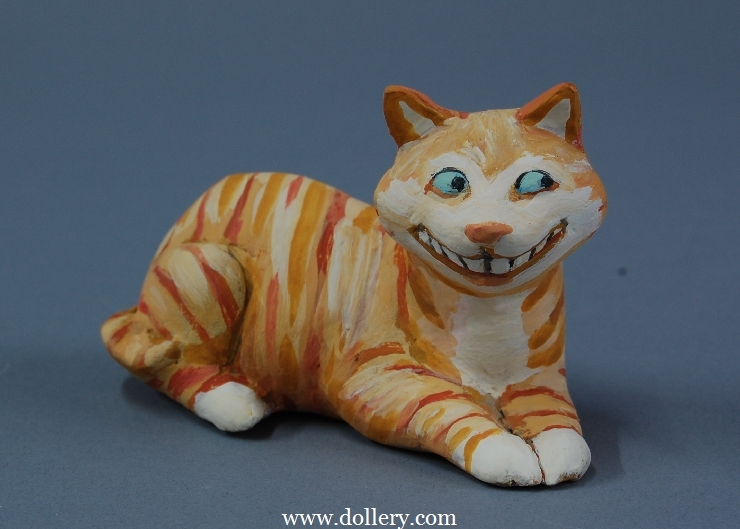 Cheshire Cat - Who can resist the Cheshire Cat's mysterious grin?